The tree view can be used to navigate Thru Explorer. The tree view is displayed by default on the left hand side of the Thru Explorer window and can be toggled on or off by clicking Folders in the action bar. 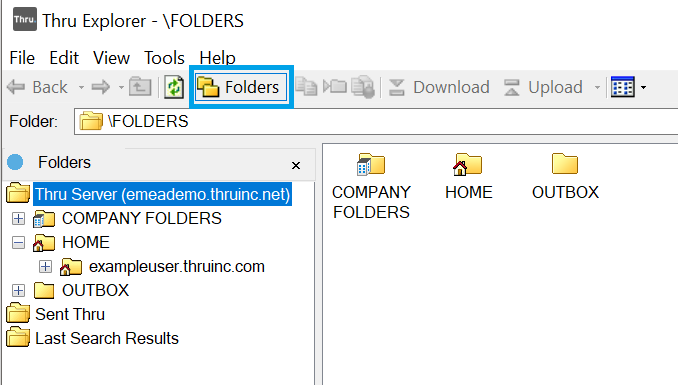 Display the contents of the folder by clicking on the folder name in the tree view. The contents of that folder display in the file view to the right, where they can be downloaded for viewing or sent to recipients. Click the plus sign in front of the folder name to display any subfolders if any are present. You can then click on the subfolder names to display the contents of that folder. You can search for files within Thru Explorer by using the search field. Type in your search terms in the Search field, and then press Enter or click Search. If you type in *car, it will display anything with car after the phrase. If you type in car*, it will display anything with car before the phrase. If you type in car, it will display anything that has car in the middle of its name.